Reporter Joe Donnelly shares what prompted him to go in search of a lone gray wolf in the NorthWest. His story in Orion Magazine tells a tale that symbolizes the fight for balance between man and nature. Like clockwork, the IPCC's big report got pre-empted, buried by wall to wall mainstream media coverage on the government shutdown. 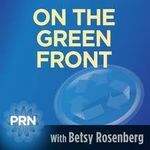 But on The Green Front we know what will have the most near--and long term--impact so we'll drill down on the report's key findings and what it means with Geoffrey Feinberg, the Yale Project's research director of climate communications. He'll also talk about Climate Change in the American Mind, their just released findings on growing climate concern in four states: red, blue and in-between. Dr. Mary Pipher has just released her 9th book, "The Green Boat". The author, activist and psychotherapist will share what prompted this book and what gives her courage, hope and energy to join the noble battle for eco-awareness and action in America. What do you get when you mix Tea Party Patriots with solar-loving Sierra Clubbers in Georgia? The Green Tea Party Coalition and stirring up the pot is Debbie Dooley who joins us with the story on how this "unholy alliance" got cooked up and why it has the Koch Brothers steamed! The devastating floods in the hills around Boulder, Colorado are being called "biblical" in proportion and not just by environmentally minded folks. Affected residents are reeling from damage to human life and property. Laura Pritchett is one such local who has written about the message nature is sending in these extreme weather events. You may have heard about the recently launched Green Tea Coalition in Georgia. We'll meet one of the founders, Shane Owl-Greason, and hear about the revelations that led to the forming of this "unholy alliance" between Tea Party Patriots and solar-power loving environmentalists, including the Sierra Club. This development is a win-win for the environment and for politics NOT-as-usual as well as containing a template for other seemingly disparate issues and interests. David Roberts of Grist.org tells why he's taking a year long sabbatical from his 24-7 climate coverage. Osprey Orielle Lake gives us a preview of the upcoming Women's Earth and Climate Summit. More than 50 wildfires are burning across the U.S. and some are threatening lives and property.Bill Gabbert, editor of the Wildfire Today website discusses how much of the increased fire activity can be blamed on climate change. Miles Grant, blogger at www.thegreenmiles.com and Communications Director of The National Wildlife Federation weighs in on the state of climate politics, "free-range blogging" and who's doing what (or not) in the mainstream media eco-sphere. The just named head of Rainforest Action Network, Lindsey Allen, talks about filling the big shoes of RAN's late Executive Director, Rebecca Tarbotton, the problem(s) with palm oil, and the strategic impacts of targeting big corporations for environmental campaigns. Steve Valk and Ashley Hunt-Martorano with Citizen's Climate Lobby join D.R. Tucker and Betsy with CCL's plan to combat the Koch Bros. ad campaign against a carbon tax. Jonathan Zaidman, Executive Director of the non-profit group, 1:1 Movement, joins us to discuss their effort to reduce the unnecessary use of plastic straws across the U.S. Hear how you can add your signature to "The Last Straw" effort aimed first at Applebee's chain of restaurants. If you need some mid-summer eco-inspiration you'll love today's program as we learn about the multi-state "I Will Act on Climate Change" bus tour. Former Virginia congressman, Tom Perriello, shares why he's involved and what gives him hope on the green front. Emily Southard: Hey Google Don't Fund Evil! Fresh from a protest outside Google headquarters Emily Southard, campaign manager of Forecast the Facts, explains why the otherwise green search giant is the target of climate activists. Fresh from the tide-pools along Northern California's coastline, science author and researcher Mary Ellen Hannibal takes us inside her work to raise awareness of the urgent need to protect biodiversity! Environmental lawyer, climate activist and founding Director of Citizens Climate Lobby--John Reaves-- shares his recent CCL lobbying experience, weigh in on President Obama's climate plan and (of course) opine on the state of climate coverage.